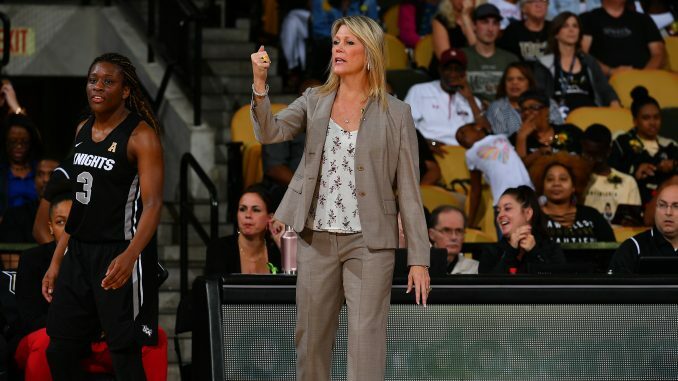 Two days after signing UCF Men’s Basketball coach Johnny Dawkins to a contract extension, athletics director Danny White was at it again on Friday, announcing that UCF Women’s Basketball coach Katie Abrahamson-Henderson had agreed to an extension through the 2022-23 season. Coach Abe has led the Knights to two WNIT appearances in her first two seasons, putting up a combined record of 43-23. The 2016-17 and 2017-18 seasons marked the first time that UCF won 20 games in back-to-back seasons since the 1980s. Prior to 2016, the Knights had lost 20-plus games in three straight seasons. There have been plenty of milestones for UCF in Abrahamson-Henderson’s first two years, including the program’s first win over a ranked opponent since joining Division I. That was a 66-62 victory at No. 22 USF in February of 2017, which was also the program’s first-ever win in Tampa. About a month later, the Knights picked up their first ever postseason win, a 73-53 win over Stetson. The team under the direction of Abrahamson-Henderson has even impressed in losses, most notably in holding perennial powerhouse UConn to a season-low 55 points in February of this year. UCF has high hopes for the 2018-19 season, with key players such as Kay Kay Wright, Nyala Shuler and Masseny Kaba returning. Tolulope Omokore and Fifi Ndour will also be back after missing last year with injuries. The pairings for this year’s AAC schedule have been announced, with the full schedule coming at a later date.